Orchards/Vineyards - Hastings Area Chamber of Commerce & Tourism Bureau, MN ? 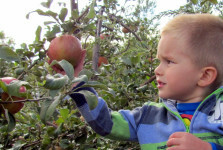 Just north of Hastings in the St. Croix River Valley there are several apple orchards which allow guests to pick their own apples, berries and pumpkins. Most of the orchards offer fun family friendly activities and in October, they team up for the St. Croix River Valley Apple Fest! Hastings is also home to two amazing vineyards, one of which was the first to make wine with 100% Minnesota grown grapes! Alexis Bailly Vineyard ,founded in 1973, was first to discover a way to burry their vines to help them survive Minnesota's frigid weather. Interested in touring multiple wineries along the river? Check out A Toast to the Valley, it provides a unique collection of wineries, breweries, historic sites and inns in the scenic St. Croix Valley.